In an insightful new column for the Washington Post, Will Dobson makes an important point about the Arab Spring. While it “has never been harder than it is today to be a dictator,” he writes, ending these dictatorships and authoritarian regimes throughout the region doesn’t mean that functioning democracies will inevitably take their place. The end of some of the harshest dictatorships has not necessarily spelled a more free world. The extinction of the thing we despise is not giving rise to the democracy we hoped for. 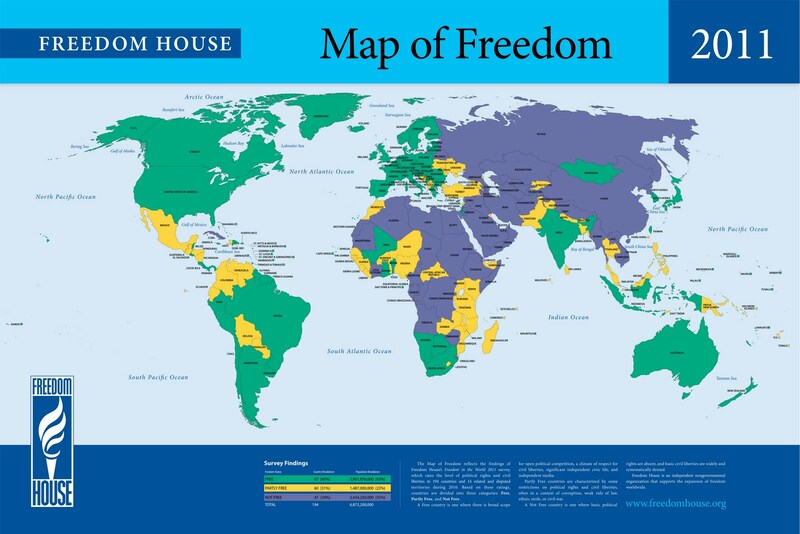 According to the watchdog organization Freedom House, political freedom has declined around the world for the fifth consecutive year, the longest continuous decline since it started monitoring these trends in 1973. Furthermore, the number of fully functioning electoral democracies is the lowest it has been since 1995. What we see instead is the rise of electoral strongmen, figures such as Vladimir Putin and Hugo Chavez, who go to great lengths to maintain a thin democratic façade to hide the fact that they have concentrated power in their own hands. Russia’s back yard is littered with authoritarian regimes — Azerbaijan, Belarus and Uzbekistan, to name a few — whose leaders seem to view their positions as lifetime appointments. China thankfully is no longer ruled by a Mao-like figure, but in some ways its economic success has made it more insidious; strongmen and would-be authoritarians look to it as a beacon of nondemocratic strength. Some in Asia may be softer — Malaysia, Thailand and Singapore — but they are no pillars of Jeffersonian democracy. Political scientists are at pains to establish the proper species of many of these regimes. Are they “semi-authoritarian,” “hybrid,” “pseudodemocratic” or something else? Suffice it to say, they are not democracies. Even many countries that have gone through nonviolent revolutions in recent years have struggled, and sometimes failed, to stay on the path towards democracy. In Georgia and Kyrgyzstan, the leaders who rode the revolution to power quickly displayed familiar authoritarian reflexes, choking free media and tightening civil liberties. In Ukraine, the Orange Revolution prevented Viktor Yanukovych from stealing an election in 2005. In 2010, he returned, this time winning elections that most say were free and fair. The fact that he won isn’t a problem; he was the people’s choice. The trouble is that since coming to office, he has proved to be the authoritarian bully we remember, intimidating civil society groups, undermining press freedoms and bringing trumped-up charges against his political enemies. Several other countries could easily be added to this list. But let’s not just look abroad for villains. A strong argument could also be made that our so-called democracy isn’t extremely democratic—especially when you consider the enormous influence that money has on our system and the serious disconnect between what most Americans say the want in polls versus what we get in terms of policy. The truth is that the struggle for democracy doesn’t end with the fall of a tyrant, but just begins. Real democracy is very hard to come by. It isn’t secured with a vote, but must be fought for every day. Whether the people of Tunisia, Egypt and Libya have the stamina to see their struggles to their democratic ends is yet to be seen. It’s also important to realize that how a nonviolent struggle is conducted before “regime change” happens can influence the sustainability of democracy afterwards. Some “unarmed insurrections” (as Kurt Schock calls them) are little more than spontaneous uprisings, as we initially saw in Libya. Others that remain nonviolent leave their societies far better equipped to build and sustain democracy. When a broadly representative, diverse, resilient and disciplined nonviolent movement with popularly accepted long-term goals has worked assiduously over a period of time to overturn an oppressor or throw out an occupier, it is far likelier — based on the historical record — that the aftermath will yield a more durable open society. This was true in India, Poland, and South Africa, to cite just a few examples. The reason for this is that well-organized movements which harness the visible support of a majority of the people have the capacity to produce enormous rehabilitative energy that can permeate a society, not only with a new sense of hope, but also by having developed a ferocious belief that everyone in the society is a stakeholder in the new order and that they cannot simply “turn the keys over” to a fresh-faced politician who merely says all the right things. And yes, that’s equally applicable to a change of administrations in a mature democracy.